I grew up loving Tove Jansson’s classic Moomin series, but I wasn’t aware that she also wrote a picture book called The Book about Moomin, Mymble and Little My. Published in 1952, it was reissued by Sort Of Books in 2005 as a beautiful hardback version and has now been turned into an iPad/iPhone app. In the story, Moomintroll is taking some milk home to Moominmamma when he meets Mymble. She is crying because she has lost her sister, Little My. They both set off to find her, exploring new places and meeting different creatures along the way, from the Hemulen who loves cleaning, to the Fillyjonk in her distinctive red dress, to the electrifying Hattifatteners. Every page ends with a gentle cliffhanger, such as “Well, guess what happened after that?” until Little My is found and you come to the safe, comforting home of Moominmamma and a lovely spread of special treats to eat and drink. The app does justice to Tove Jansson’s text and illustrations. The translation by Sophie Hannah reads brilliantly (and is also brilliantly read aloud by actor Sam West in the narrated version). The black, white and block colour illustrations of Moomin Valley and its inhabitants retain their atmospheric otherworldliness. The original book has cut-out illustrations, which are re-imagined in different ways in the app, such as the paper “ripping” on the Fillyjonk’s page. There are numerous interactions on every page, many of them really inventive. Some are triggered by tilting the iPad, such as setting off a rock fall in the cave. Some are triggered by touching items. 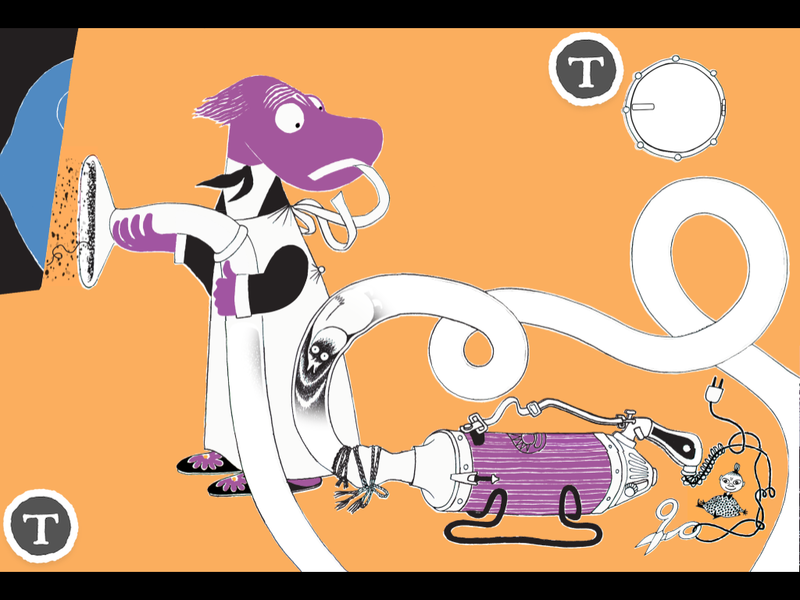 You can find Moomin and some wiggly spiders inside the Hemulen’s vacuum cleaner, or switch on the Hattifatteners’ electric shocks, which keeps Mr Tall (aged 4) amused. Little My is hiding on some pages, and it’s fun to find her. Little Miss Chatterbox (aged 2) loves that as soon as you tap on Little My, she hides somewhere else! There is a certain degree of tapping at random to find what works, but I think hints would spoil the illustrations in this particular app. The text is in a small and intricate font in keeping with the style of the book, but not easy to read for young readers. The text boxes can be easily opened by tapping the T signs. Pages are turned by swiping, which has to be done from the very edge of the screen; this is fine with practice for little fingers and the page turn is very realistic. This app was an instant hit with Mr Tall, Little Miss Chatterbox and me. It is a great introduction to the Moomin series for young children, and we’ll be picking up some of the chapter books as bedtime stories in the not too distant future. The price is at the higher end of the spectrum, so it isn’t a spur-of-the-moment purchase, but worth it for the calibre of story, illustrations and well-integrated interactivity. I really recommend it for a first Moomin experience, and I’m sorely tempted to pick up the physical copy of the book too as those cut-out pages look just beautiful! The Book about Moomin, Mymble and Little My, developed by Spinfy/Sort Of Books/WSOY. Compatible with iPhone 4/4S and iPad. 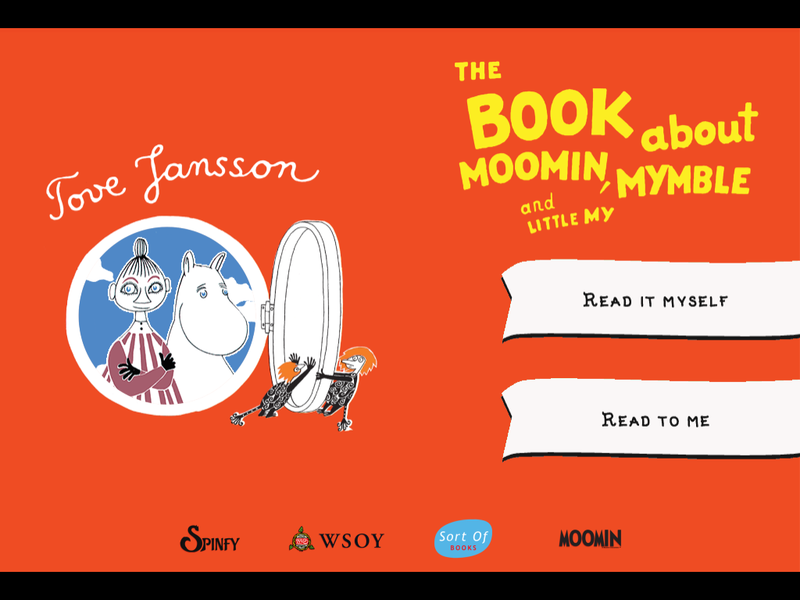 Available from http://itunes.apple.com/gb/app/moomin-mymble-and-little-my/id531261142?mt=8 priced at £3.99/$ 5.99 at time of writing. EDIT 31 Aug – for one week only the app is on sale for £0.69/$0.99 – snap it up!